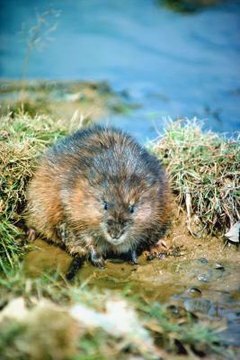 The muskrat (Ondatra zibethicus) is a sturdy rodent that shares some physical similarities to the beaver. The muskrat is mostly herbivorous and mostly nocturnal. They thrive in aquatic environments. Muskrats are rapid, skilled swimmers, able to stay submerged for more than 15 minutes. Fully mature muskrats generally weigh between 2 pounds and 5 pounds, according to the Minnesota Department of Natural Resources. Their bodies are usually approximately 20 inches in length, including about 9 inches of tail. Muskrat fur is thick. The basic diet consists of water plant roots. Duckweed, cattails and water lilies are particular favorites for muskrats. Once in a while, they consume animal remains too -- think frogs and fish. They also occasionally dine on live turtles, snails and clams. Some of their prominent predators are hawks, foxes, American mink, barred and barn owls, coyotes and raccoons. Muskrats are native to North America and live from Southern California to northern portions of Alaska and Canada and throughout the central states. The rodents are absent from some parts of the United States, however, such as Florida. Muskrats have been introduced to Argentina, the Ukraine, Japan, France, Finland, Albania and Austria. Muskrats are big fans of wet habitats -- especially those with a minimum depth of between 4 and 6 feet of water, indicates Animal Diversity Web of the University of Michigan. Common muskrat habitats are rivers, canals, streams, swamps, marshes, ditches, ponds and wetlands. They gravitate toward areas that feature ample aquatic plants. Muskrats build dome-like lodges made entirely out of mud, brush and water plants. These lodges are not unlike those made by beavers, although beaver lodges are bigger. The lodges provide shelter for muskrats and occasionally for such creatures as toads, ducks, turtles and snakes. Some animals nest inside of the lodges. Not all muskrats reside within lodges, however, as some of them opt to live in burrows instead.